mophie makes charging your iPhone easier than ever. 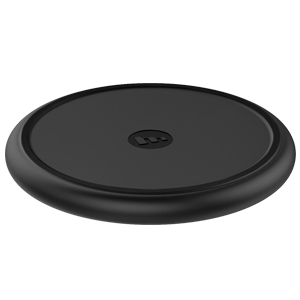 This wireless charging pad includes the latest Qi technology and delivers up to 7.5W fast-charging speeds to your phone on contact. The non-slip finish ensures perfect placement and the included standard U.K. Plug Adapter (three pin) means you get everything you need to get charging right in the box. Wall adapter suitable for use in the U.K. and Ireland. Up to 7.5W Fast Charge speeds. Leverages the latest Apple wireless technology to deliver safe, charging speeds with up to 7.5W of power. Optimised, high-current wall adapter. The wireless charging base includes everything you need to begin charging as soon as you open the box.